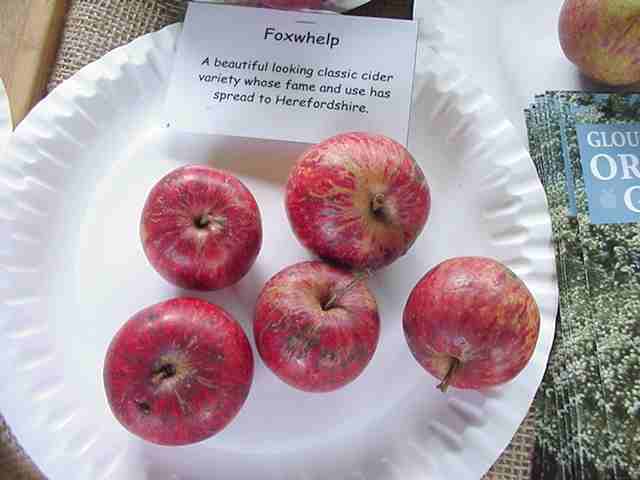 Foxwhelp apples are cider apples which have been popular for several centuries. The information below attempts to correlate details from various old publications about the original Foxwhelp cultivar and subsequent Foxwhelp cultivars, which may be seedlings or sports from the original cultivar and its clones. Foxwhelp is a traditional bittersharp West Country cider apple. It is a red skinned apple, picked in September. It was first recorded in 1600, and is said to originate from Gloucestershire UK . It is self sterile in pollination group B. Fruit, medium sized, two inches and a half wide, by the same high; roundish, inclining to ovate, uneven in outline, caused by several obtuse ribs, which terminate in ridges round the eye; in good specimens one side is convex and the other is flattened. Skin, beautifully striped with deep bright crimson and yellow; on the side next the sun it is darker crimson than it is on the shaded side, where the yellow stripes are more apparent; the surface is marked with several dark patches like scabs, which are a never-failing character. Eye, very small, set in a narrow, shallow, and plaited basin; segments, short, somewhat erect, and slightly divergent. Stamens, marginal; tube, funnel-shaped. Stalk, three-quarters of an inch long, obliquely inserted by the side of a fleshy swelling, which pushes it on one side and gives it a curving direction. Flesh, yellow tinged with red, tender, and with a rough acid flavour. Cells, open, elliptical, pointed. This is one of the most valuable of the cider apples of Herefordshire. 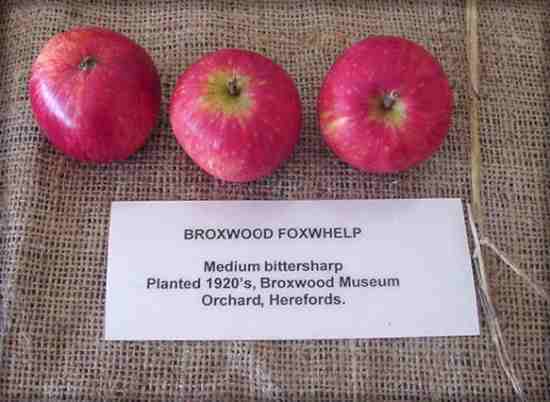 The earliest record we have of the Fox-whelp is by Evelyn in his "Pomona," which is an appendix to the Sylva "concerning fruit trees in relation to cider" This was first published in 1664, and at that time and long after the great apple of Herefordshire was the Red-streak. The Fox-whelp is disposed of in a lew words - "Some commend the Fox-whelp." Ralph Austen, who wrote in 1653, makes no mention of it when he says, "Let the greatest number of fruit trees not onely in the orchards but also in the feilds be Pear-maines, Pippins, Gennet-Moyles, Red-streaks, and such kinds as are knowne by much experience to be especially good for cider." Neither is any notice taken of it by Dr. Beale in his "Herefordshire Orchards, written in an epistolary address to Samuel Hartlib, Esq.," in 1656. The first notice of it after Evelyn is by Worledge in 1676, who merely says, "The Fox-whelp is esteemed among the choice cider fruits." In Evelyn's lime it appears to have been regarded as a native of Gloucestershire, for Dr. Smith in the "Pomona," when writing of "the best fruit (with us in Gloucestershire)," says, "The cider of the Bromsbury Crab and Fox-whelp is not fit for drinking till the second year, but then very good;" and in the quotation at the head of this paper "a person of great experience " calls it "the Fox-whelp of the Forest of Deane." Although all who have noticed the Fox-whelp up to this period have spoken of its merits as a cider apple, its cultivation must not have been on an extensive scale, otherwise it would have been better known than it appears to have been. Even Philips, in his celebrated poem on "Cyder," seems as ignorant of its existence as many of the writers on orchards were at that period. The first appreciative notice of it with which we are acquainted is found in a letter to a friend written by Hugh Stafford of Pynes in Devonshire, Esq., bearing date 1727. He says, "This is an apple long known, and of late years has acquired a much greater reputation than it had formerly. The fruit is rather small than middle-sized, in shape long, and all over of a dark red colour. I have been told by a person of credit that a hogshead of cider from this fruit has been sold in London for £8 or eight guineas, and that often a hogshead of French wine has been given in exchange for the same quantity of Fox-whelp. It is said to contain a richer and more cordial juice than even the Red-streak itself, though something rougher if not softened by racking. The tree seems to want the same helps as the Red-streak to make it grow large. It is of Herefordshire extraction." National Fruit Collection, lists possible scion wood . National Fruit Collection lists possible scion wood. Fruit, small, two inches and a quarter wide, by two inches and seven-eighths high; roundish ovate, even in its outline. Skin, very dark crimson over the whole surface, almost a mahogany or chestnut colour, except a small portion on the shaded side, which is a little, and very little, paler. Eye, small, somewhat open, with short, erect, convergent segments, set in a very shallow plaited basin. Stamens, marginal; tube, short conical. Stalk, three-quarters of an inch long, very slender, inserted in a wide, rather shallow cavity. Flesh, yellow, deeply stained with crimson both under the surface of the skin and at the core, very tender, pleasantly flavoured, with a slight acidity. Cells, ovate; axile. This apple is very widely grown throughout the county, and is to be found in the majority of "apple heaps." Its definite ovate shape, smooth surface, and dull colour, make it quite unmistakable. It bears very freely, and this, perhaps, is its best qualification, for the cider made from it, is thin and poor. The Black Foxivhelp, notwithstanding its small amount of sugar, is still esteemed in some orchards, when mixed with sweeter varieties, for the amount of tannin it contains. The results of the analysis, show it to be a variety of little value. The tree is hardy, grows upright and bears well. The sooner the trees of the Black Foxwhelp are re-grafted, or cut down, the better. 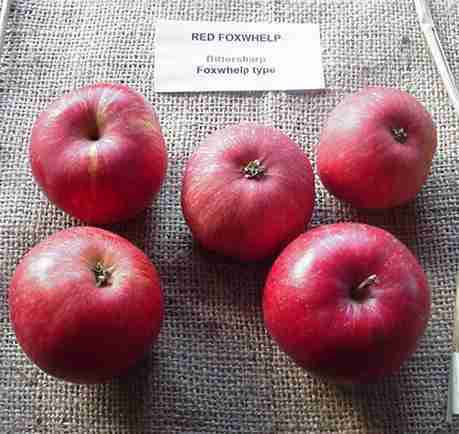 These several apples bear the Foxwhelp name. They have no special history, but the inference is, that they are, what tradition supposes them to be, seedlings from the Foxwhelp. This apple is one of peculiar interest in Herefordshire. The epithet " new " will be used in treating of it, but merely to prevent any confusion in discussing the question, as to whether it is " new," that is, a seedling ; or whether it is the true " old " Foxwhelp, restored to a flourishing rejuvenated form by a careful system of grafting and re-grafting. This is a question that has been warmly discussed by the growers for some years past. At first sight, the distinction between them seems very marked ; both the tree of the " new " Foxwhelp and its apple, are much more luxuriant than the " old " Foxwhelp. The apple of the " new " Foxwhelp is not only larger, but in its general character it is broad in shape — or in other words, its lateral is greater than its longitu- dinal diameter — whilst the apple of the " old " Foxwhelp is smaller, and usually oblong in shape ; but on a careful examination of the trees of either kind, the apples are so similar in shape and appearance, that it would be impossible to distinguish them, if thrown together. The difference of size and shape is due simply to the im-proved vitality and luxuriance of the growth of the tree. The points of similarity between them are very striking. There is the same brilliant colour ; the same tough, leather-like skin ; the same eye ; the same long slender stalk set in its deep, narrow channel ; and to this it may be added, they have the same period of arriving at maturity. Then again, the chemical analysis shows no greater difference between them, than may be accounted for, by the more watery juice of the fruit of the more free growing tree. The history of the " new " Foxwhelp can be traced with some clearness. A farmer of the name of Yeomans, living at Cowarne, between 60 and 70 years ago, took an unusual interest in the " old " Foxhelp, and both in that parish, and at Canon Pyon, to which he afterwards migrated, he grafted and re-grafted it on healthy stocks, until he restored its luxuriance of growth. Another farmer, a Mr. Crowe, and Messrs. Skidmore, Miles, and Williams, wheelwrights, of Canon Pyon, systematically, but separately, carried on the system of re-grafting, beginning on seedlings of the " old " Foxwhelp. Their success had been well established by 1823, when first Mr. Jay, of Lyde, and afterwards Mr. Bosley, of Lyde, and Mr. Hill, of Eggleton, obtained grafts, and thus from the centres of Cowarne and Canon Pyon, intelligent fruit growers got their supply of grafts, and we have the handsome, luxuriant, and useful fruit of this time. With this distinct history there can scarcely be a doubt, that the "new" Foxwhelp is simply the "old" historic variety rejuvenated by careful management, but the disbelief in this has arisen from the absence, in part or altogether, of the true Foxzvhelp flavour in the cider made from it, which is so remarkable and characteristic in the " old " Foxtvhelp. As a matter of fact, its cider is more sweet and luscious than that made from the " old " Foxwhelp, and in flavour resembling far more the cider made from the Cozvarne Red apple. It must be remembered, however, that sometimes for years together, the cider from the "old " Foxwhelp itself and usually oblong in shape ; but on a careful examination of the trees of either kind, the apples are so similar in shape and appearance, that it would be impossible to distinguish them, if thrown together. The difference of size and shape is due simply to the im- proved vitality and luxuriance of the growth of the tree. The points of similarity between them are very striking. There is the same brilliant colour ; the same tough, leather-like skin ; the same eye ; the same long slender stalk set in its deep, narrow channel ; and to this it may be added, they have the same period of arriving at maturity. Then again, the chemical analysis shows no greater difference between them, than may be accounted for, by the more watery juice of the fruit of the more free growing tree. The history of the " new " Foxwhelp can be traced with some clearness. A farmer of the name of Yeomans, living at Cowarne, between 60 and 70 years ago, took an unusual interest in the " old " Foxwhelp, and both in that parish, and at Canon Pyon, to which he afterwards migrated, he grafted and re-grafted it on healthy stocks, until he restored its luxuriance of growth. Another farmer, a Mr. Crowe, and Messrs. Skidmore, Miles, and Williams, wheelwrights, of Canon Pyon, systematically, but separately, carried on the system of re-grafting, beginning on seedlings of the " old " Foxwhelp. Their success had been well established by 1823, when first Mr. Jay, of Lyde, and afterwards Mr. Bosley, of Lyde, and Mr. Hill, of Eggleton, obtained grafts, and thus from the centres of Cowarne and Canon Pyon, intelligent fruit growers got their supply of grafts, and we have the handsome, luxuriant, and useful fruit of this time. With this distinct history there can scarcely be a doubt, that the "new" Foxwhelp is simply the "old" historic variety rejuvenated by careful management, but the disbelief in this has arisen from the absence, in part or altogether, of the true Foxwhelp flavour in the cider made from it, which is so remarkable and characteristic in the " old " Foxwhelp. As a matter of fact, its cider is more sweet and luscious than that made from the " old " Foxwhelp, and in flavour resembling far more the cider made from the Cozvarne Red apple. It must be remembered, however, that sometimes for years together, the cider from the "old " Foxwhelp itself had a suspicion of the true Foxwhelp flavour which is so highly esteemed, and moreover, that it is only of late years, comparatively speaking, — that is, after the trees had become of considerable age — that the cider has gained the pride of place it now so deservedly holds. The Rejuvenated Foxwhelp has intrinsic merits of its own, and for this cause alone, it should be grown much more plentifully than it has hitherto been. Every orchard should possess it, and its owners may await with good faith, the development of the true Foxwhelp flavour in its cider, as the trees grow older. Speaking of it as an apple, it may be said, that it is above the medium size, and its brilliant colour recommends it to every one. It sells well in September as a " pot fruit." It has a piquant, acid, rough flavour, which would not please all palates to eat raw, but as a cooking apple, it is excellent for pies and puddings ; and " the apple of all others to make sauce for the Michaelmas goose, or for a roast leg of pork." Originally from Bulmers, Hereford, England, prior to 1920. A medium to large upright tree; leaves characteristically curled or wavy. HP Bulmer Ltd, Orcharding Division, Plough Lane, Hereford HR4 0LE, sell standard and half standard cider, culinary and dessert varieties of apples and pears. Tree orders, availability and price lists can be requested by e-mail from Mrs Gill Turner, gt [at] bulmers.com. Technical tree and orchard information can be requested from Chris Fairs, cjf [at] bulmers.com, +44(0)1432 345285.
compiled by Mel Wilson / Diversity website; pictures by ND.